A driver whose lorry hit a motorway bridge that collapsed has been given a suspended jail sentence for causing serious injury by dangerous driving. Heavy machinery on the back of Alan Austen's lorry struck the pedestrian bridge on the M20 in August last year. The 64-year-old had originally pleaded not guilty at Maidstone Crown Court, but changed his plea. The crash injured a motorcyclist and resulted in £1.5m of damage to the bridge. Austen, of Darlington, County Durham, was sentenced to 12 months imprisonment, suspended for two years, and was ordered to undertake 200 hours of unpaid work. Jim Shaw, 73, came off his motorbike and broke three ribs trying to avoid the debris. Speaking after the crash, he said: "The bridge was coming down almost like in slow motion. "As that came down it was a matter of throwing the bike on the floor and going for it." Judge Philip Statman said it was "remarkable" no-one died as a result of the crash. The bridge collapsed near the junction with the M26, which links the M25 London orbital with the M20. The road, which is the main route to the Channel Tunnel and Port of Dover, had to be shut while two large cranes worked to clear the debris. 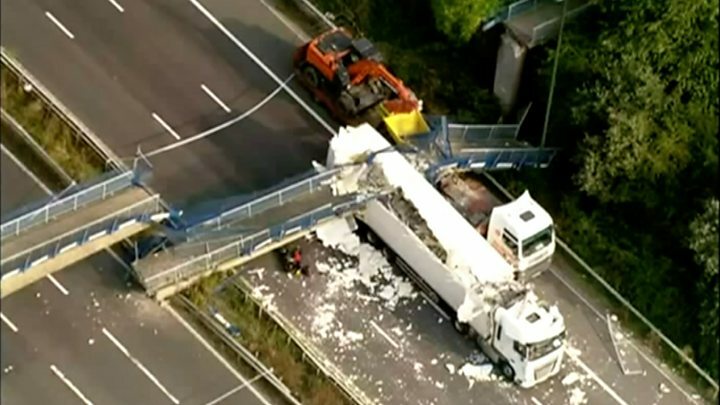 David Skelton, from the Crown Prosecution Service, said: "It was our case that it would have been obvious to a competent and careful driver that the load was too high to be transported safely under the bridge. "The defendant had supervised the loading of the items and did not measure the height before setting off, ignoring concerns raised by two colleagues. "He stopped just prior to the crash to check his load, but this was obviously inadequate."